Tree Children is another sculpture within two blocks of my home. 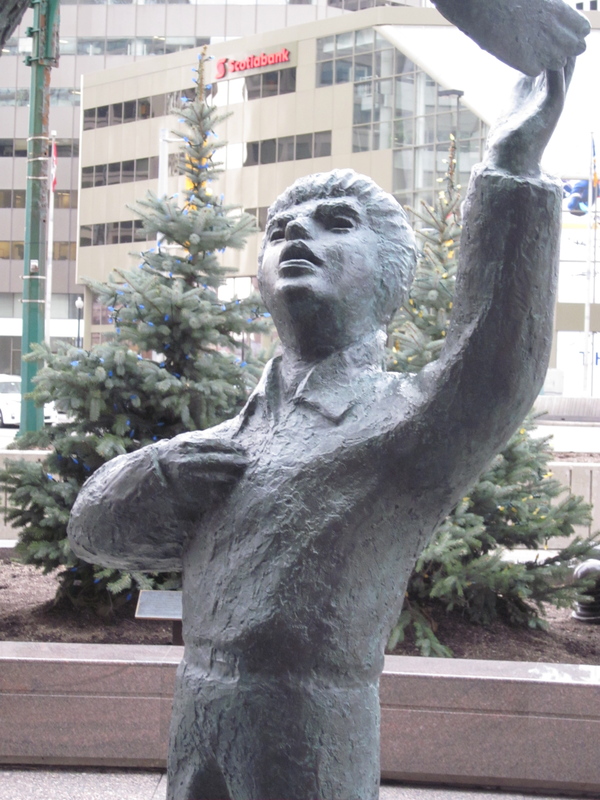 It stands just in front of the Richardson Building at the corner of Portage and Main and was installed in 2002. It was created by Leo Mol, who also crafted the James Bond– William Stephenson statue I wrote about. I don’t know if kids still climb trees. 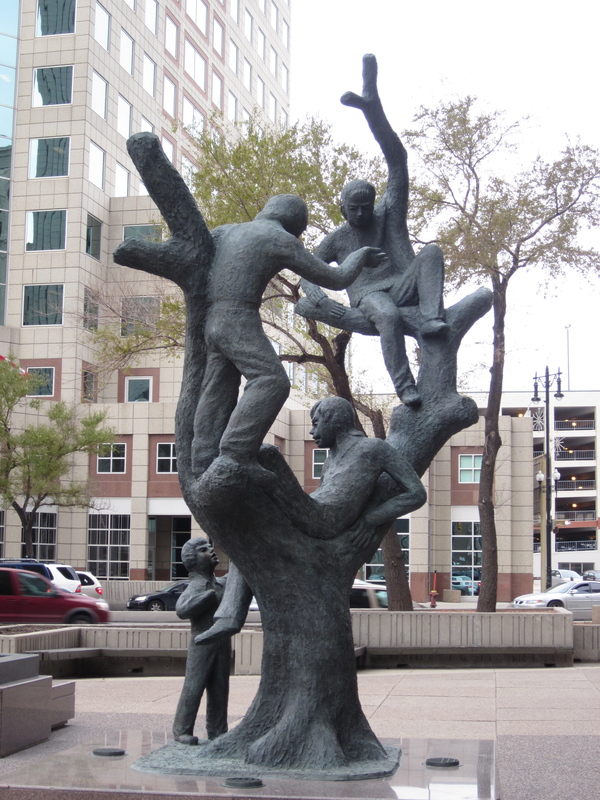 Maybe it is not considered safe anymore, but this statue shows the adventure of tree climbing. The four children here are each unique and seem to display a different personality. The way Mol has sculpted them they really could be boys or girls. The texture of the sculpture is almost ‘clay-like’. Leo Mol’s father was a potter and when Leo was a child living in Ukraine his first art experiences were working in clay with his Dad. This child seems to be in charge and is perched front and center in the main crook of the tree. It looks like it is up to him to decide who gets to play on the tree or not. 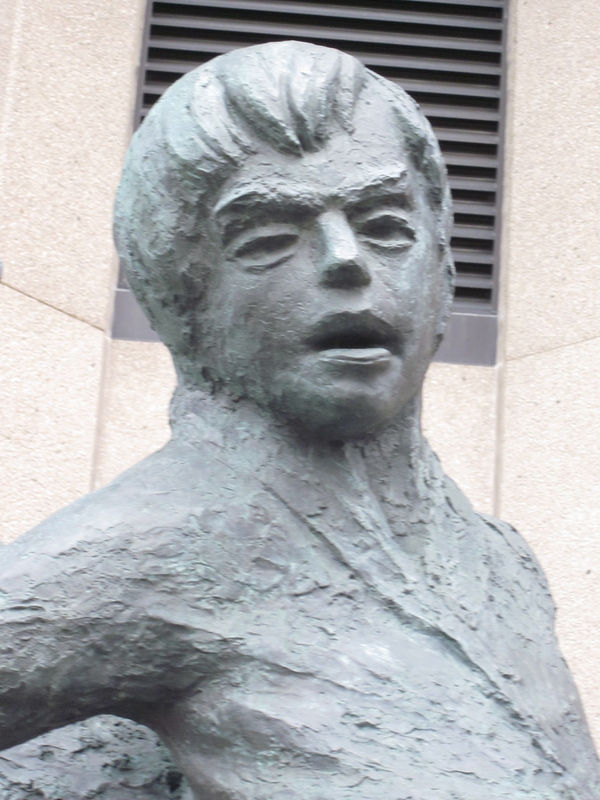 Although the sculpture is called Tree Children, I think the faces of the characters look wise beyond their years and could just as easily belong to adults as well as children. I see this fellow as being the narrator and organizer of the group’s imaginary play on the tree. This child is the thoughtful one. She’s up high, looking down, perhaps with a little trepidation, hanging onto the limbs with both hands and sitting, not standing. Her lone spot up on the high limb gives her a little solitude and a place to think. She has climbed up to her perch carefully and likes it, but she won’t be jumping down out of the tree. She’ll crawl down cautiously. I am struck by the fact that none of the children in the sculpture are smiling. They all look rather serious in fact. Was Leo Mol trying to say something about childhood–that children are really just ‘mini-adults’, that even while tree climbing they are serious and thinking about life? 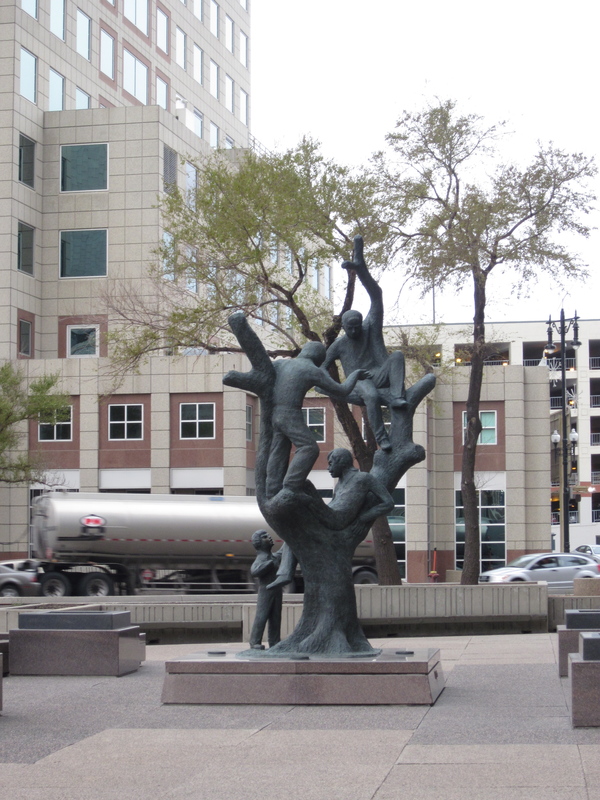 It is interesting that this sculpture is in the heart of downtown Winnipeg where the only trees aren’t really ones you could climb, and in a place where you expect to see traffic, business people, and stores but not children playing. I’d be interested in knowing why the Richardsons chose to put this particular sculpture in front of their building. I’d also be curious to find out what children think about this sculpture.